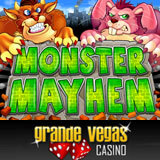 As if all the casino bonuses they're offering during their Halloween Madness celebrations weren't enough, Grande Vegas Casino has launched its new Monster Mayhem online slot machine and is giving players a bonus of up $100 just to try it out. The new Monster Mayhem from RTG is a 50-line slot machine with a giant reptile, an enormous pink rabbit and a hulking orange cat stomping and crunching their way through the urban jungle. The giant, animated city beasts “Smash” and “Crash” trigger the re-spin feature, with the reels spinning up to 10 times. During re-spins, prizes are multiplied by 1 in the first re-spin, by 2 in the second, by 3 in the third and so on. A “City” is the Scatter symbol. Scatter wins are added to line wins and multiplied by total bet. Independent Minor and Major jackpots are triggered totally at random. To claim their 100% (up to $100) casino bonus, players just enter the coupon code “MONSTERMAYHEM” when they make a deposit. This bonus is available only until October 21. In more Halloween Madness at Grande Vegas, three lucky players will be randomly chosen at the end of the month to receive a cash-back casino bonus refunding everything they deposited in October. Many more will receive surprise bonuses when they check their casino message centers this month. There are more than 300 casino games to choose from at Grande Vegas Casino, including slots, blackjack and roulette. Several slot machines with progressive jackpots over a million dollars are among the most popular. Someone playing Jackpot Pinatas could win nearly $1.7 million. On Aztec’s Millions the progressive jackpot is currently over $1.3 million. The Midlife Crisis/Shopping Spree jackpot is just over a million and Cleopatra’s Gold is over $275K for a total of over $5.2 million in the jackpot pool. Such exciting prizes to be won, going to make sure I use the coupon code soon as only have 2 days before this ends!